Director – Toa Fraser, Screenplay – Alan Sharp, Based on the Novel My Talks With Dean Spanley by Lord Dunsany, Producers – Alan Harris & Mathew Metcalfe, Photography – Leon Narbey, Music – Don McGlashan, Visual Effects – Lipsync Post (Supervisor – Tom Collier), Special Effects – Enterprises Unlimited FX, Production Design – Andrew McAlpine. Production Company – Transmission Films/The New Zealand Film Commission/Screen East Investment Fund/Aramid Entertainment/Lip Sync Productions LLC/Mathew Metcalfe/Atlantic Film Group. England around the turn of the 20th Century. Each Thursday, publisher Henslow Fisk goes to visit his aging and irascible father Horatio who lives a life of unvarying order. Together they attend a lecture on reincarnation by Swami Nala Prash. At the meeting, they meet the cleric Dean Spanley and later come across him at Horatio’s club. After Henslow encounters Spanley a third time that day, he on inspiration invites him to dinner, saying that he has a bottle of Tokay, which he knows to be Spanley’s favourite drink. However, the Tokay proves more difficult to procure than Henslow thought and he is forced to obtain the services of the conveyancing specialist J.J. Wrather, whom he also met at the lecture. As the dinner commences, Henslow is startled when Dean Spanley starts describing his previous life as a dog after he has had a couple of glasses of Tokay. Henslow becomes fascinated with finding out more about Spanley’s prior canine life and has to go to great length and cost to obtain more Tokay so as to invite Spanley back for further visits. He comes to the gradual realisation that the dog that Spanley is describing might have been his father’s beloved dog Wag. Lord Dunsany (1878-1957) is regarded as one of the great fantasy writers, certainly one of the most influential of the early half of the 20th Century, although is less well read today. Many other prominent fantasy writers such as Robert E. Howard, H.P. Lovecraft and Neil Gaiman have spoken of a debt of inspiration to Dunsany’s style. The more mundanely born Edward Plunkett inherited the eighteenth barony of the Irish Dunsany peerage in 1899. Although serving in the military and an accomplished sportsman and chess champion, Dunsany’s greatest interest was in writing. He began publishing with The Gods of Pegaña (1905), set in a secondary fantasy world of his own creation, which he revisited in several other books. Dunsany produced some 80 books, as well as numerous plays and poems. A substantial number of these fall within the fantasy genre (although he did write in other genres). Lord Dunsany’s most famous work was probably The King of Elfland’s Daughter (1924), a classic work set in the land of faerie. One of his more appealing series was the Jorkens tales, which consist of five books, wherein Dunsany invented what became known as the ‘club story’, a far-fetched story usually told by men over drinks at a club. The surprise about the popularity of Lord Dunsany’s work is that he has never been adapted to the screen before with the exception of the classic It Happened Tomorrow (1944) about a newspaper that printed tomorrow’s headlines, which was purportedly based on a play that was taken from one of Dunsany’s stories. Dean Spanley comes from Lord Dunsany’s novel My Talks with Dean Spanley (1936). Dunsany was apparently a dog lover and wrote a number of stories about dogs. Dean Spanley is a New Zealand-British co-production from director Toa Fraser. Toa Fraser is a New Zealander born of Anglo-Fijian parents who had success as a playwright, most notably with No 2 (1999), loosely based on his own family experiences, and was then granted the opportunity to write/direct the film adaptation of his play with No 2 (2006). Fraser also wrote the script for Vincent Ward’s Maori Wars epic River Queen (2005) and Dean Spanley is his second film as director. He subsequently went onto direct a film of the ballet Giselle (2013), the Maori Wars action film The Dead Lands (2014) and 6 Days (2017) about the Iranian Hostage Crisis. The script comes from Alan Sharp, a Scottish writer who has a number of interesting credits, including the scripts for Ulzana’s Raid (1972), Damnation Alley (1977), The Osterman Weekend (1983), Rob Roy (1995) and The Lathe of Heaven (2002). The New Zealand Film Commission has taken some flack in recent years from people like Peter Jackson for their staid ways and unwillingness to take chances. As though to prove him wrong, they funded Dean Spanley – a film about a dog reincarnated as a man – which surely must be the most eccentric offering to ever cross their boardroom table. Just trying to imagine the raised eyebrows Toa Fraser and Alan Sharp must have gotten as they pitched the project around the various production companies listed on the credits leaves you with an uncontrollable case of the giggles. Dean Spanley is essentially another of Lord Dunsany’s club stories. The entire film takes place as a series of after-dinner shaggy dog stories (couldn’t resist the pun) – one where a man becomes a little drunk and relays details of his past life as a dog. Imagine some combination of My Dinner with Andre (1981) – an entire film that takes place as a series of philosophical discussions and stories of world travels over a single dinner conversation – and Oh Heavenly Dog (1980) but where the reincarnation runs in reverse (dog to man rather than vice versa). A more serious minded comparison might be the underrated Fluke (1995). Of course, Dean Spanley could not be more removed from a film like Oh Heavenly Dog. Where Oh Heavenly Dog came in the tradition of the light fantasy films of the 1940s and Disney in the 1960s/70s, Dean Spanley is an Edwardian drawing room drama. Its company is more works like Brideshead Revisited (1981) or A Room with a View (1985) and the collected works of Merchant Ivory. The surprise about a film that takes such an eccentric premise seriously and is mostly told as a potentially not very dramatically exciting series of after-dinner conversations, is that the results are delightful. 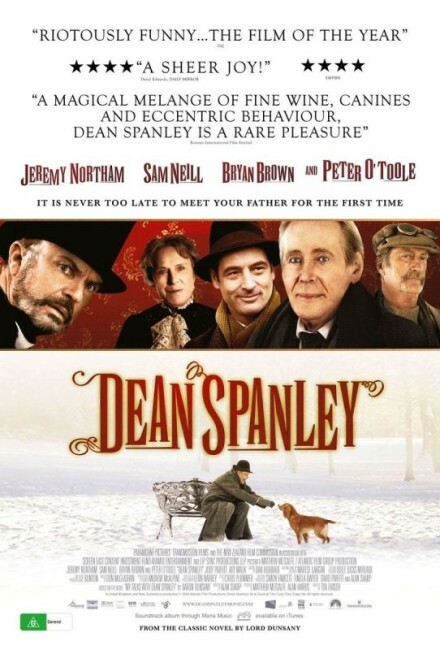 Certainly, Dean Spanley is not a film that is ever going to wake the box-office up but it is enormously appealing. Alan Sharp’s writing, his wielding of the formal dialogue of the period and the sharp observations and dry wit that emerges through the characters is simply superlative. 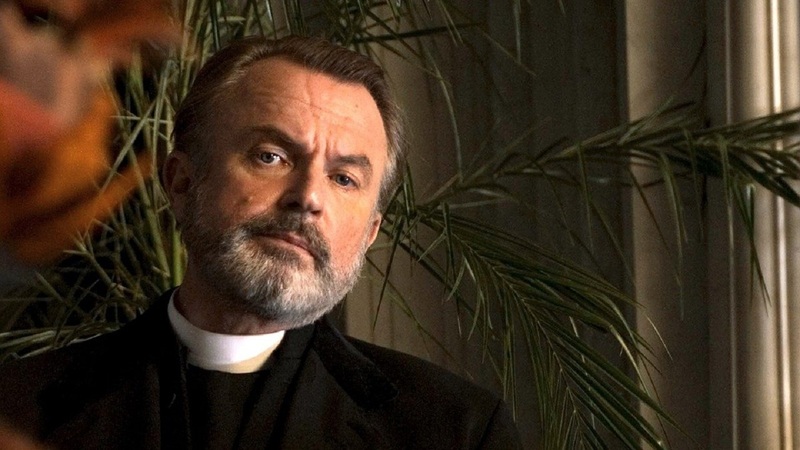 Sam Neill’s monologues about his life as a dog are captivatingly written, none more so than the final dinner where he movingly relays the adventure that led to his death. 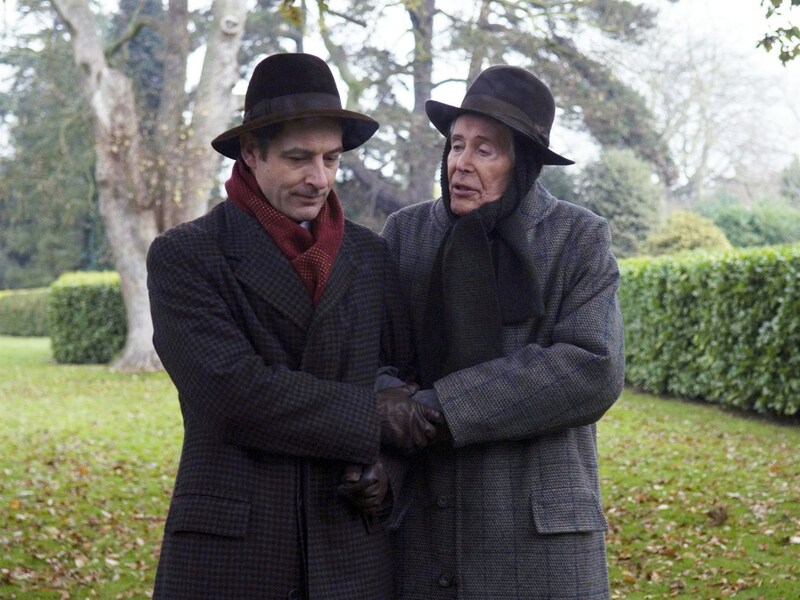 Underneath the dinner table discussions lies a touchingly told story about how a son manages to connect with his aging father who is set in his ways and has suppressed many of his feelings. The end scenes with Peter O’Toole playing with his new dog in the snow are charming. The film is serviced by an excellent cast. Jeremy Northam plays a dull part appropriately, while both Sam Neill and Bryan Brown have a ball in their respective roles. Even the underrated Judy Parfitt fills a throwaway part with unexpected depths. Although the one who runs rings around the youth surrounding him is the great Peter O’Toole. At age 76 and looking decidedly infirm as he plays most of the part from a wheelchair, O’Toole still steals the show with a regally commanding irascibility. (Winner in this site’s Top 10 Films of 2008 list. Nominee for Best Adapted Screenplay, Best Supporting Actor (Sam Neill) and Best Supporting Actor (Peter O’Toole) at this site’s Best of 2008 Awards).